A visit to Limehouse Conservation Area is an opportunity to experience the natural wonders of the Niagara Escarpment as well as the cultural heritage of its past. The Bruce Trail and its side trails take visitors through a variety of Escarpment landscapes and even into its geological heart at an area known as the “Hole in the Wall”, where ladders cut through fissures in the escarpment rock. 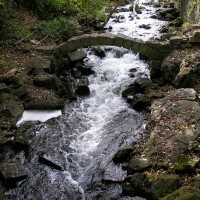 Credit Valley Conservation has installed and re-opened the bridge over Black Creek at Limehouse and the Bruce Trail has been re-routed accordingly, taking the visitor past unique natural and cultural features. Trails also take visitors past remnants of the Lime industry where they can stand before huge lime kilns and associated features like an old powderhouse. These cultural heritage resources of the 1800’s are representative of an important part of Ontario ‘s past associated with the Niagara Escarpment resources. A community project is underway to protect the deteriorating historic features of Limehouse CA . Your assistance is required. For your safety, please remain on the designated Bruce Trail or side trail at all times and obey all signs and fencing throughout the property. Thank you for your cooperation and if you have any concerns, please feel free to contact us at 905-670-1615.